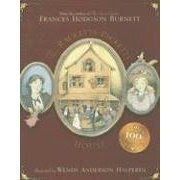 The Racketty-Packetty House, Francis Hodgson Burnett. "Now this is the story about the doll family I liked and the doll family I didn't. When you read it you are to remember something I am going to tell you. This is it: If you think dolls never do anything you don't see them do, you are very much mistaken. When people are not looking at them they can do anything they choose. They can dance and sing and play on the piano and have all sorts of fun. But they can only move about and talk when people turn their backs and are not looking. If any one looks, they just stop. Fairies know this and of course Fairies visit in all the dolls' houses where the dolls are agreeable. They will not associate, though, with dolls who are not nice. They never call or leave their cards at a dolls' house where the dolls are proud or bad tempered. They are very particular. If you are conceited or ill-tempered yourself, you will never know a fairy as long as you live. So begins the story of Meg and Peg and Kilmankeg, Peter Piper, Gustibus and Ridiklis. The Racketty-Packetty House is the story of a charming old-fashioned doll family, dolls so delightful that the fairy queen and her fairies love to visit, and of their adventures when their dilapidated racketty-packetty doll house is replaced by Tidy Castle and its noble residents who positively scorn the Racketty-Packetty family and their unfashionable neighborhood behind the door. I read this many times when I was a little girl, and remembered it as a lovely and sweet story, one of my very favorites, so I was delighted to see it in a recent Chinaberry catalog. It's a perfect read-aloud: A wonderful story and lovely language, and it's nice and short for younger listeners. My fine young gents aren't particularly interested in dolls or fairies (though they're not uninterested either) and they loved the Racketty-Packetty family, especially Peter Piper. They were on tenterhooks after lunchtime reading yesterday, wondering whether Racketty-Packetty House would be taken to the trash heap and burned. The most charming part of the story is the way the Racketty-Packetty house dolls approach life. When Peter Piper's pant leg rips clean off, he's delighted because he can kick his leg so much more easily. When Ridiklis remarks on Tidy Castle's ten course meal, the Racketty-Packetty family decides to serve ten courses of turnips (all they have to eat), and they have so much fun at it that they certainly enjoy their meal far more than the Tidy Castle family. And best of all, one of their greatest delights is to join hands and dance in a circle into they fall down in a heap in giggles. There's romance and suspense, and a lovely ending. It's a story about making the most of things, and finding joy and laughter to be the very best things in life. Read it for free: Racketty-Packetty House at Project Gutenberg, with the beautiful original illustrations. It's Tuesday! Better yet, I knew it was Tuesday when I got up in the morning. All relaxed go-with-the-flow summer long I'd find myself halfway through the day thinking, "What day is it again?" Now that we're back in the swing of our school schedule, I know the day of the week before it's over. 1. 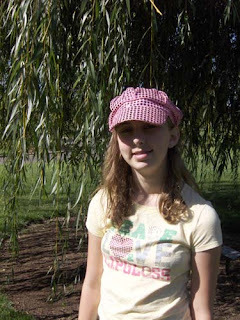 Nature days. 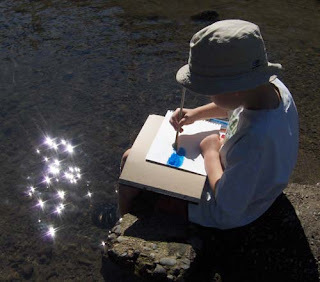 Spending a school day painting with our feet in the canal, or hiking around the park, or digging in the garden is marvelous. Our marvelous miraculous world is a part of our daily lives, a center for our studies. 2. 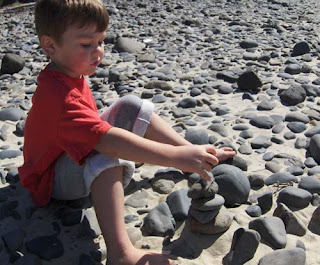 Family-directed, interest-based learning. 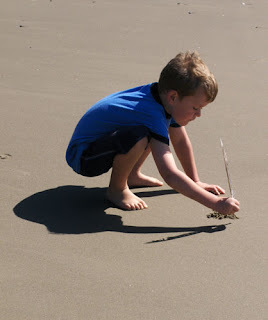 We can individualize learning for different learning styles, interests, paces. 3. We get to name our own school. How many families get to do that? 4. Art studies. "I want to paint really cool stuff when I grow up-- kind of like Pablo Picasso," fine young gent, six, told me this morning. "He's my favorite artist." He knows about Pablo Picasso and Jackson Pollock. He recognizes their art, and will say things like, "Mom that reminds me of Picasso." He sees himself as an artist. 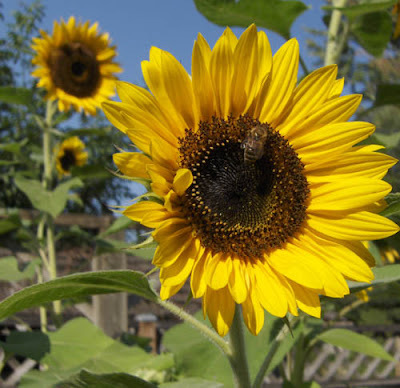 The sunflowers have bloomed in the garden and we're doing a sunflower study in conjunction with our artist study-- Vincent Van Gogh. 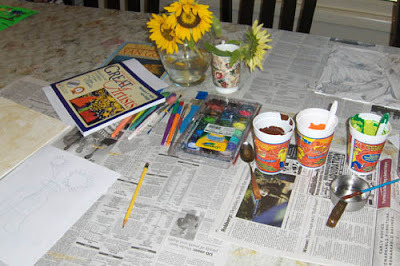 We've been sketching and painting sunflowers. 5. I used to like sleeping in, but now we've got a lovely lady in high school so our sleeping-in days are over. I miss breakfast at nine. It sure is nice starting school early, though. 7. Beach days. Or pond days, or puddle-jumpin' days, or museum days. We can go and do. 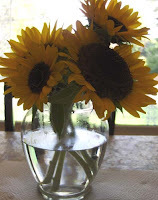 We can wring the last little bits of sunshine and warm out of these fall days. 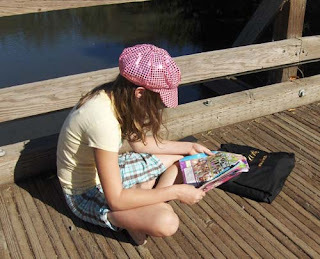 In the spring when the sun appears we head outdoors for nature and garden studies. We study at the park, take the morning off to watch birds, paint with our feet in the canal, study pond creatures by going to the pond, go to the library. 8. Learning new things. The big "Aha!" moments, the delights of learning something new, tackling a new subject. I love teaching, and I love learning with the kids. 9. Flexibility. We really never know what each day will bring. Some days we're done by noon, others the school day will meander into the late afternoon or even the early evening. No day is exactly like another. If a project inspires us, we follow our noses until we're ready to move on. 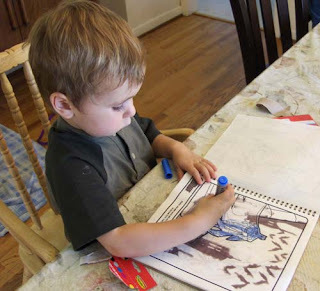 No artificial time constraints-- "Art time is over. Time to put away your brushes!" How frustrating that would be to my meandering thoughtful middle gent, who needs time to carefully and earnestly organize his thoughts and materials. 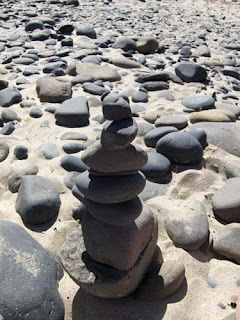 How off-putting it would be to first grade gent, who needs time and focus so that he doesn't rush himself, which leads in its turn to dissatisfaction with his work. Today we spent an hour at our drawing lesson, just experimenting with markers-- What kinds of lines do these markers make? Or these? What happens if you hold the marker like this? Turn the paper? Try this kind of line? 10. I like my kids. This time is precious to me. I love these moments we spend together. 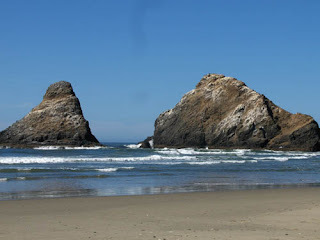 Visiting: Heceta Head lighthouse and beach. The Oregon coast is beautiful. But the wind....that cold wind stinging your legs with sand, blowing through your ears, tying your hair in knots. In the fall, the temperature difference between inland and the beach evens out, and the wind dies down. I'd packed a beach bag three weeks ago, but we couldn't make it. "It's now or never," I told loving husband this morning. "If we don't go now it'll start raining by the time we're able to head to the beach." We knocked out math and science, then hit the road. The weather forecast for the beach today: High 60's, winds 5-10 mph, partly cloudy. The actual weather at the beach today: Low to mid-70's. A light breeze. Not a cloud in the sky. Hiking: Up the hill to the lighthouse. I'm not sure it counts as "hiking" when it's only half a mile up a gently sloping gravel path, but it was a hike to the fine young gents. I secretly wondered if I'd be packing the youngest gent up the last hill, but he ran the entire way. They were fascinated by the lighthouse. 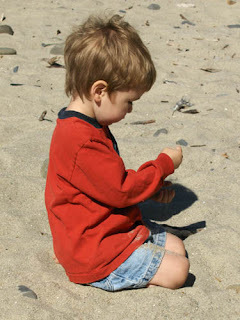 Playing: With sand, of course. I must digress into a dog story: I really didn't want to leave Poppy home. But I was worried about trying to manage three young rowdy gents and a puppy and the ocean. "Ok, think it out....what's the worst thing that could happen?" I asked myself. Here's a tip for those of us with active imaginations: Don't ever ask oneself, "What's the worst thing that could happen?" Well, since I asked....tsunami, earthquake in the tunnel, I'll be driving over several bridges, a young gent could be sucked out to sea, horrible car crash.....not a useful question. 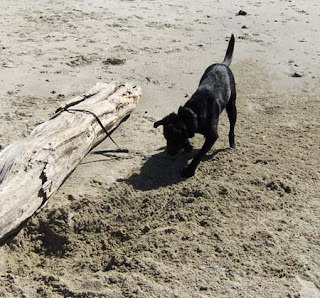 Reframe: "What's the worst thing, barring some unforeseeable and unlikely tragedy, that can happen if I bring the dog?" She might potty in the car. Oh, well that's not likely. Along comes Poppy on the beach trip. Along the way she had horrible gas, so I pulled over to let her go to the bathroom. I stood there on the side of the road as she sniffed around having a good ol' time, then she sat down and looked at me like, "Okay, this is fun, but what next?" "Mooo-ooom! It still stinks in here!" She pooped. In the car. Diahrrhea. (With some intact hazelnuts....poor thing. We've got a filbert tree in our yard, and clearly she'd swallowed some whole, shell and all. Too much information? Imagine having to clean it up.) But get this....on the floor was some paper. 8.5x11, the glossy newspaper flyer kind. When I was loading the car I'd considered picking it up off the floor of the car but decided to wait until we got home. God is good. That dog pooed right on that paper and even left a clean edge for me to grab as I slid it into a plastic bag. The worst had happened. We made rock towers and bridges and castles. They were waaaaay cool. We also looked in the tide pools, but the good ones were underwater, watched birds, splashed in the ocean and explored a cave. The Penderwicks is sweet, playful, funny, poignant, full of the victories and innocences and heartbreaks of childhood. After the first three chapters, I thought, "Eh, it's nice enough." By the end of the book I was thoroughly charmed. The Penderwicks won the 2005 National Book Award in the category of Young People's Literature, and it's easy to see why. It's got an old-fashioned charm. The subtitle sums up the story: Summer, four sisters, two rabbits (and the cute teenaged owner of the rabbits, who sets a young lady's heart a-flutter), and a friendly boy with whom they form a fast friendship. Lovely responsible Rosalind, fierce and loyal Skye, dreamy Jane, and shy imaginative Batty travel to a summer cottage with their absent-minded father and their beloved hound, Hound. They aren't met with dragons or magic or pirates or grand adventures, just a kind boy who needs their friendship. By the end of the book I loved the Penderwick girls fiercely, and I wasn't quite ready for the Penderwick vacation to end. I can't wait to read this to the fine young gents. Looking for an even more ringing endorsement? Lovely lady, 12, chose this for her free reading book. "Are you enjoying The Penderwicks?" I asked when she was about halfway through the book. Her answer was an very enthusiastic "Yes!" complete with wide eyes and a vigorous nod of the head. High praise indeed. More about The Penderwicks here. 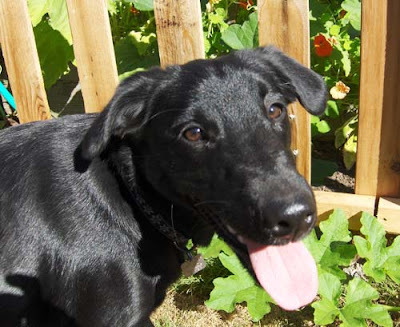 Black-nosed, brown-eyed, floppy-eared, pink-tongued, tail-waggin' nuisance of a dog. We used to have an entire wall of mirrors in the basement playroom. Apparently one of the previous families living in this house had a dancer in the family. Enter our three active boys with their wagon, balls, swords and the like, and we ended up with a wall that's two-thirds mirror and one-third boring plywood sheet. 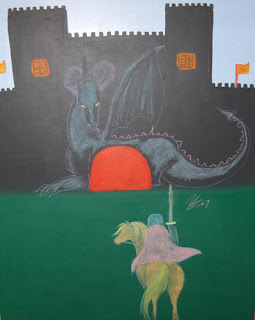 Lovely lady, 14, made this chalkboard mural for her brothers.The castle on the hill is a part of the mural; the knight and dragon are a chalk drawing. The fine young gents discovered it this afternoon, so now the knight is galloping through a field of flowers and letters of the alphabet, and the dragon has been defeated by a princess holding a sword and shield. Look like a fun project? We got the idea from a Family Fun magazine chalkboard mural project. Follow the link for a list of supplies and directions. Playing: With the school boxes. 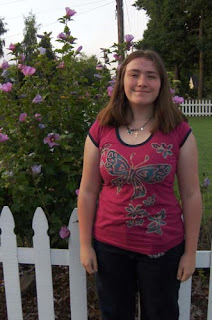 Last week, on high school lovely lady's first day of school, the rest of us went not-back-to-school shopping. I looked for good clearance deals on school supplies, and the fine young gents each chose something special for his school box. Two-year-old gent chose a Batman Color Wonder set. Cool. Four-year-old gent chose a box of giant sidewalk chalk. He was sorely tempted to switch to a Superman color wonder set, but decided to stick with his novelty item. The chalk doesn't fit in his box very well, so the next time I came home from the store I had Twistables crayons. He was delighted because he'd been fascinated by his brother's Twistables, and besides, his chalk was outside in the back yard. First grade gent finally got his Twistables colored pencils. Last year he agonized over the choice between the giant box of crayons and Twistables. He chose the crayons, and he's been waiting a whole year to add Twistables to his box. Now he uses them for everything. 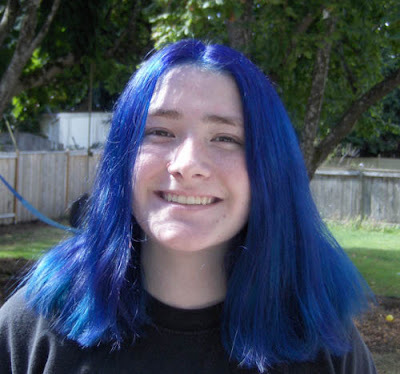 Lovely lady did not choose because, as I mentioned in our previous first day of school post, she's too grown-up for nearly everything. Once we got home, she changed her mind about being too grownup and asked for some pretty colored pencils. After our morning nature outing and lunch I thought our school day was over. The outing was certainly all I had planned. Instead, each of the fine young gents hauled his school box to the table and they settled in for an hour of coloring. They decided that they were school puppies, Blueberry, Blackberry and Fluffy. 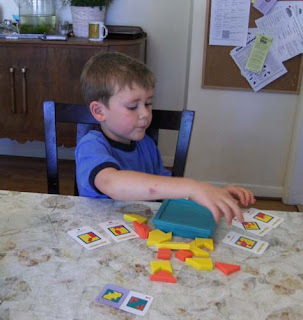 Fluffy looked at his math book and decided to do a few pages of math for fun, then worked a shape puzzle. Blackberry, age four, colored with his own twistables then traded with his brother, then traded back, and little Blueberry ("I a bwoo puppy!") colored Batman. 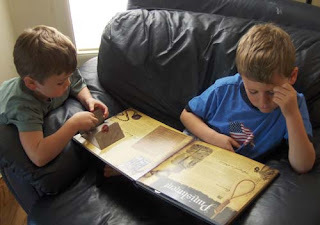 Reading: A pirate book. When the fine young gents aren't puppies, they're pirates. "Yaarr! Hah !" I hear all day long. 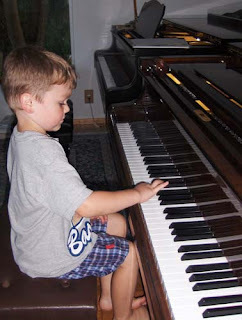 Listening: Suzuki Piano School, Volume 1. Blackberry puppy had his first piano lesson last week. He is so delighted by his teacher, Miss Melissa, that he wrote her a love letter: "Tolly loves Miss Melissa." It's on the bulletin board in her studio. Because the Suzuki method is initally based on learning to play by ear, one of my parent jobs is to play the piano CD for the fine young gents at least once each day. The CD opens with four different variations on "Twinkle, Twinkle, Little Star," each variation repeated twice for a grand total of Twinkles eight times in a row. I have days when I think my ears will cringe right off my head if I have to hear a Twinkle variation one more time, and the lovely ladies usually leave the room, but the fine young gents don't seem to mind. The rest of the week went swimmingly. Tuesday was our first regular school day, and it was peachy, smooth as silk. Wednesday was rocky, especially for lovely lady, as we all negotiated our new routines. Thursday was right smack in between, and Friday we zipped through the morning's work, went on a science field trip to the pond, and started our first art study: Van Gogh and sunflowers. I can already tell it's going to be a good year. 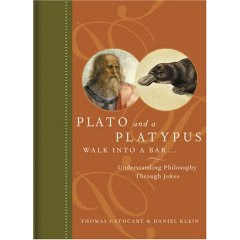 Plato and a Platypus Walk Into a Bar...: Understanding Philosophy Through Jokes, Thomas Cathcart and Daniel Kline. If you enjoy philosophy, read this book. If you're looking for a book that's going to teach you the basics of philosophy, read a philosophy book first. Then read this book. If you haven't the slightest interest in philosophy but you like a good joke, read this book. From intelligent subtle jokes to downright groaners, Plato and a Platypus Walk Into a Bar... is just plain funny. From the introduction, entitled "Philogagging": "The construction and payoff of jokes and the construction and payoff of philosophical concepts are made out of the same stuff. They tease the mind in similar ways....What the philosopher calls an insight, the gagster calls a zinger." I laughed out loud reading Plato and a Platypus, literally, several times. It's great fun to read, and better still, the fun is witty and intelligent. It's one of those books that makes you snort and giggle and read the funniest bits out loud to the person sitting next to you. Even (or especially) the glossary is funny, and the timeline at the back of the book had me in stitches. And I know this isn't nearly as important as the content of a book, but there's something about holding Plato and a Platypus that's just a sheer reading pleasure too. It's got a cool cover and pretty end papers. It's small and neat. There's no stupid book jacket to lose or wrinkle or tear. (I can't be the only one who hates book jackets.) The book is a gem visually too, and fits just right in the hand. Watch the authors on YouTube. One of us thought she might be too old to play Poohsticks. We've all got high hopes that someday she'll outgrow being too grownup for, well, just about everything. For now it's enough to enjoy the peaceful day together. 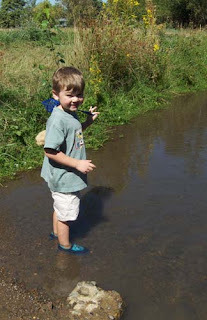 We also played in the canal. 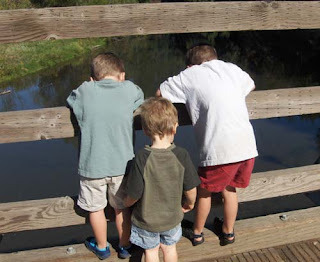 The boys thought they might want to scoop for minnows or walk over to the pond, but they just threw rocks and splashed one another. 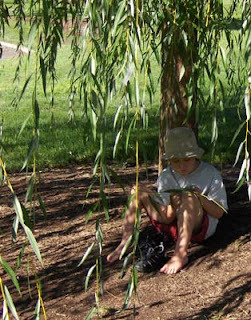 A first-day-of-school nature outing sets the tone for our school. 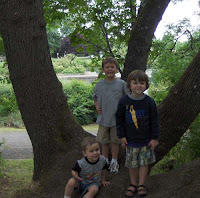 (Read about last year's first-day nature day here.) 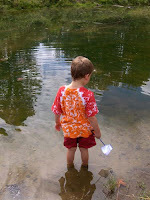 It helps us to celebrate the freedoms we enjoy in our homeschool. Sitting in the sunshine, splashing in the canal after minnows, picking blackberries, painting and drawing. Perfect. 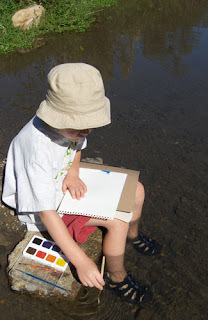 Painting and drawing: A nature sketch. I told lovely lady and the fine young gents, "The only goal we've got is to come home with some sort of nature sketch or painting." A little later: "Ready to start drawing?" A short while later, another prompt and more groaning, at which I had a mini-tantrum. (You know this one right? The kind where you want to scream but don't. Instead you just express yourself very firmly with a slight edge of hysteria to your voice.) "This is the one thing I expect from this nature day. A nature sketch. 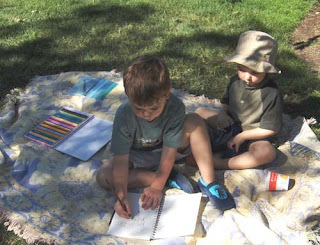 I'm getting out the materials and I expect each of you to draw something you can see here at the park." Rotten kids. Forget everything I've ever said about child-led learning. 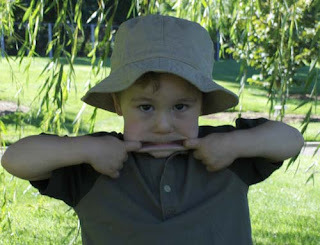 I am a control freak at heart, and I was getting some nature art out of those kids or else. My gentle encouragement and enthusiasm (heh, heh) worked like a charm. 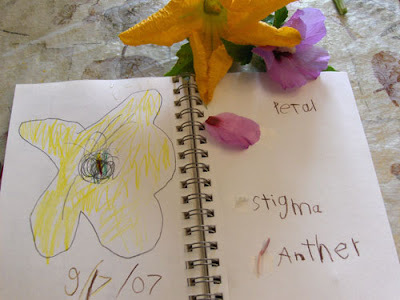 Once I'd actually doled out the art materials-- colored pencils to the younger gents and their sister, and paints to the eldest of the gents-- there was nothing but peace for twenty minutes. They were all truly contentedly absorbed in their art. Even Poppy settled down for a nap next to the red wagon. We brought home a lovely drawing of the weeping willow, which was also the subject of my own small sketch, a sketch of a water skipper and a drawing of a dark purple blackberry, some bright scribbles, and a watercolor of the other side of the canal. As lovely lady and the fine young gents painted and sketched a man rode over the bridge on a bike, did a double take, circled back and stopped to watch for a moment. "Looks like a great day to homeschool!" he shouted to me with a grin. "Perfect!" I yelled back. He gave us a thumbs up and rode off. Musing: I started to say something to the kids along the "freedoms we enjoy because of homeschool" line, only it came out like this: "Aren't you glad we're not stuck at a desk today like all the kids in school?" Ick. Not what I meant to say, but I moved on. I'm sure the lady and gents didn't notice, but I kept pondering on why pointing out to my children that their friends are "stuck" in school while we enjoy the sunshine left a bad taste in my mouth. First of all, on a practical level, the lovely lady remaining at home would like to return to school, and pointing out that she's not there simply adds fuel to her fire. Second, we've got a kid "stuck" in school as we wander the park. And third, on a more philosophical level, it seems to me that saying, in essence, "Neener-neener, we're so much more lucky than those poor schmucks in school" creates an artificial and unnecessary sense of separation. We don't homeschool to set ourselves apart, we don't define ourselves by our schooling choices. 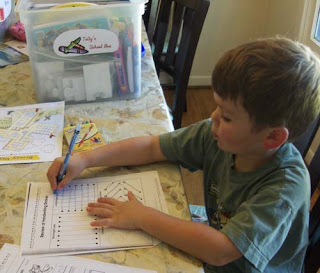 Our family has chosen homeschooling because it suits us. It's something we do, not who we are, and it's not that homeschooling is inherently and always better, simply that it's better for us. We can enjoy and notice the benefits without feeling superior. Later I commented as I looked at the morning's artwork, "What a lovely day. It was wonderful getting to play at the park and learn at the same time. 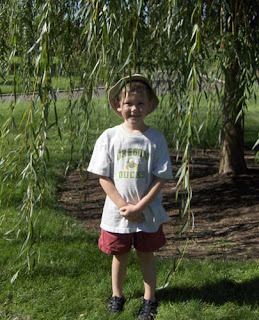 I'm so glad our nature studies are a part of our school." Aaaaaaah, much better. That's how I really feel. It was a lovely day. It was wonderful. I am glad. We are so blessed to have this opportunity to create learning experiences that are meaningful for our family. Although, in the interests of complete honesty, I must admit I feel a little smug and self-congratulatory when I look at this picture and think, "Well, you have to admit, this is way better than sitting at a desk." One of the silver linings of our elder lovely lady's return to school-- we're all up early so that we can spend breakfast with her before she leaves for her day. Which in turn gets us a nice early start on our day. 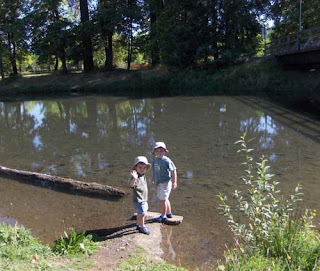 We walked, splashed, drew, played, and threw sticks off the bridge all before lunch. Part Two, the afternoon, coming soon! Today I harvested lavender and sweet Sungold cherry tomatoes and one tiny zucchini. 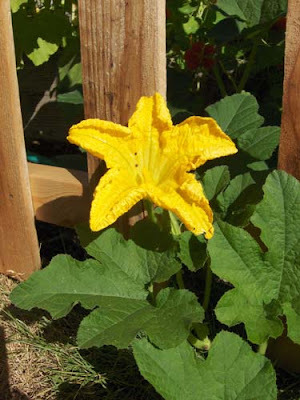 The garden is a jungle of squash and pumpkin blossoms and vines, and the sunflowers are blooming. We've got an almost-golden pumpkin in one corner. Life is good. Summer's last hurrah, blackberries. We went blackberry picking last night, up on the hill at the ranch with my Busy Farm sis and some of the cousins. Lovely lady and I picked two huge bowls of blackberries. By now they've been turned into blackberry-peach crisp, several jars of jam, or bagged and frozen for smoothies. There's something about picking blackberries. Maybe it's because we grew up eating the blackberries at the edges of the field on the farm where we grew up. Mom always knew we'd been eating blackberries when we came in with purple hands and mouths. Blackberries rank up there with shelling peas and the smell of fresh hay when it comes to plunking me firmly back into my childhood. Maybe it's the effort it takes to pick them. We always come home scratched and dirty, a bit apprehensive about poison oak, vowing to wear long sleeves and pants next year. Maybe it's because they're free. 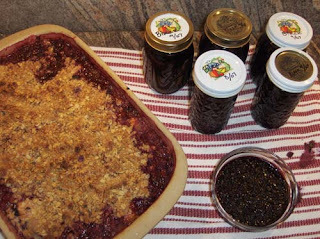 The fruits of my labors (heh heh), not counting the crisp which I would have made with the peaches anyway: Seven jars of jam plus four bags of freezer berries cost me a grand total of $4, if you total the costs of the sugar, pectin, and freezer bags. Maybe it's because blackberries signal the end of summer. Not the calendar end of summer, but our yearly blackberry expedition signals that fall is approaching, that school will start soon, that summer fruits are nearing the end and we'll have to settle for frozen, canned, jammed until sweet strawberries return in June. Or peach crisp, if you have no desire to risk poison oak and get scratched to bits just for the perfect dessert. 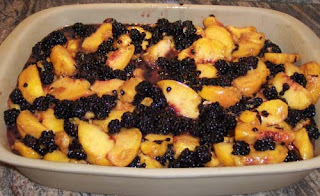 Or blackberry crisp if you haven't got any peaches handy. Really, you can't go wrong. Heat the oven to 375. Spread 2 cups oats evenly on a large baking sheet and toast them in the oven for 7-10 minutes. They're ready when they smell fragrant and oaty. This dries the oats slightly and gives them a nice nutty flavor. Let cool. 10 Tablespoons chilled butter (unsalted if it's handy, otherwise use salted), cut into 1/2" pieces then cut into the flour mixture using a pastry blender (like this one). You can also use your food processor to mix the flour mixture and cut in the butter. The pastry cutter is easier to assemble and clean though, so it's worth the little bit of elbow grease it takes to use it. Place the entire mixture into the refrigerator to chill while you assemble the filling. To skin peaches easily, boil some water in a large pot. Once it's boiling, drop the peaches in for about 30 seconds (more if the peaches aren't very ripe), then remove with a slotted spoon and place into a bowl of ice water. The skins should be loose enough that you can pull them right off the peaches. 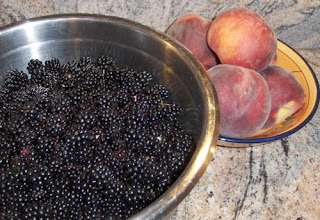 I started with the peaches, peeled and sliced, then added enough blackberries so that I had 12 cups of fruit total. Pour the fruit mixture into a deep 9x13 dish. (If you're halving the recipe, use a square baking dish.) Sprinkle the chilled topping evenly over the fruit. Bake at 375 for 40-45 minutes, until the fruit is bubbly and the topping is golden-brown. It tastes even better when you've got good company, so invite the neighbors over. Serve warm with a little vanilla ice cream. Peachy keen. What Would the Founders Do? : Our Questions, Their Answers, Richard Brookhiser. What would our founding fathers do about the many problems and issues facing our country today? How would they deal with weapons of mass destruction, education, social security? What might be their stance on unwed mothers, intelligent design, immigration? Historian Richard Brookhiser addresses these issues and many more facing our political leaders and our country today from the persepctive of our country's founders. If you're looking for concrete yes and no answers to most of the questions, you won't get them. In What Would the Founders Do? 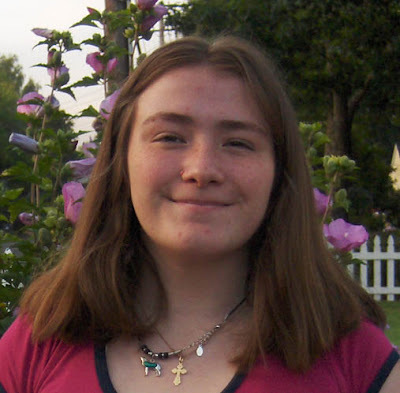 Brookhiser uses their writings and their lives to both speculate what they might do and think about today's problems. In so doing, he highlights the contentiousness and the brilliance of our founding fathers in a way that's entertaining and thought-provoking. In the last pages of the book, Brookhiser sums up by saying, in part, "Contention is as much a part of their legacy as their principles. It fills our public space, it fills our minds. Mere ambition generates conflict in times of peace and prosperity, and the world provides enough real problems to give us serious things to quarrel about....What we can take away from the founders, whether we are honoring the letter of their law, or improvising madly, as they sometimes did, is a style of thought, a way of working, a stance." In other words, our founding fathers would likely debate many of today's issues as fiercely as we do ourselves.